Idolatry literally means the worship of an “idol”, also known as the worship of a cult image, in the form of a physical image, such as a statue. 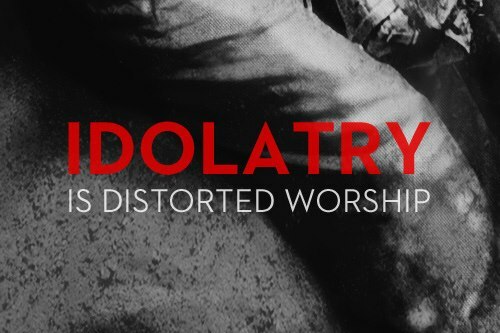 In the Abrahamic religions, namely Christianity and Judaism, idolatry denotes the worship of something or someone other than God as if it were God. First point of note, Rome was a creation of Babylonian families. From this we must accept that everything other than what comes from within, is in fact a someone or something other than God. This has to include written works we call books. By that I am not claiming nothing of worth is to be found in books, only that one must never allow anything outside to contradict the heart, including books. This may sound rather odd, yet if we truly follow the impulses from within as opposed to following what has been written by another, we would never ever err in the breaching of our personal morality. More importantly, when we are in error we will take responsibility for it and understand that our error is exactly that, ours, and something only we can rectify. This gave us the mechanic of ‘Forgiveness,’ both of self and those we see as our enemy as a maxim to cultivate to retain our balance. The Man that was Jesus made only one decision that would separate him from the majority, he choose to refute and rebuff falsity and fake wherever he found it from which he earned the grace to fulfil his destiny. In so doing he is said to have come to the point in which he walked with God, and thus his work was and remains, divine. In order he did not aim his words directly at a person or indeed an institution, he spoke in parables in order he could continue to offer the teaching without entangling his words with any particular physical entity, he always, when pressed, called the antagonist “the Laws of Man.” This changed when he overturned the money tables within the grounds of the Temple that claimed to worship the Father. A clear distinction in the relationship between Man and Man, we call Trade, and what we today call Commerce. The former is a natural mechanic expressed by two parties, the latter represents the addition of a fig that requires a Man to operate as a ‘Person‘ under Caesar. In other words, the daily activities of mankind are good enough without the inclusion of the parasite that is Commerce, a cloak, a garment of glamour, that adds big costs to your deals and exchanges and yet neither of the original participants are enriched any further from the initial agreed exchange, it is the Caesars that gain from the extra costs, a revenue from which they build a bureaucracy that moves to enslave Man through contracts that are unnecessary to achieve the original simple exchange. Study. If we are to honour Jesus we must celebrate his life and his message, of course for the last 1300 years and more, Christians are forced to celebrate his death, all focus is about his death. Is this to foment terror in all peoples suggesting anyone that dare to act against the moneylenders, will suffer the same fate? As a point of fact, Christianity is not the Bible. Christianity is the message within the Gospels. The Gospels are not a teaching about how to deal with non Christians, they teach you how to be with God by refuting all that is false. The Gospels therefore present the will of truth. The only maxim coming out of the doctrine as relates to others, is to let them be, take no part in their foolishness, and to keep them out of your space. “The Kingdom of God is within” – from this maxim all earthly institutions that claim to represent God through Christ, are unnecessary to your salvation, by walking the path itself, is the salvation and the armour you need is thus earned. The Gospels are only a guideline to the path which your heart encapsulates as standard, as such they are also are not required. You cannot trust the heart if you are following the path of another. The message of Jesus brought back the original laws of God, which is to follow your heart not your head. The head is full of deceptions (the magician in the Tarot) that aim to subvert your autonomy by installing fears not already present. A pure heart knows no hurt, it understands that hurt is held within the mind as memory and must be transcended in the mind if one is to prevent the hurt becoming a censor for the heart. The ultimate message of Christ is to take responsibility for your actions. By recognising falsehood and denouncing it as a path for you, you are walking the path to truth. Others will follow. The schisms we are experiencing today are a direct result of allowing Caesars (Emperors) to decide who Jesus was, and therefore what Christendom is. In all conclaves after Constantine, the elect by-passed the message and moved the entire institution to an Idol as the intermediary between you and God. An absolute necessary if you are to build an empire for humans with God at the top. That said, art and written works that inspire you to the heart, cannot be said to be an object of worship. Appreciation of, or to use the words of the Church, veneration, has value, to suggest otherwise would be to cancel out all artistic endeavours by Man itself, removing the right brain and its language of symbols which is an impossible task if you intend to encourage balanced individuals. But we do create platforms based on the doctrines, in the case of Christendom we are speaking of the canon law. Such body of works not only become the focus of worship, they become the rule upon pain of death. But like all institutions that hold power, they become the battleground for those that seek power, this can be seen in changes to the cannon that do not fit within the doctrine they take as source. If you operate under the live birth record, this places you under the jurisdiction of the Holy See. You will pay a 9% tax directly to the Vatican as a form of dispensation, or under the mafia language, protection. When you operate under the birth certificate you are classed as outside the protection of the Holy See, you are dead to them and ripe for torture under the laws of inquisition. 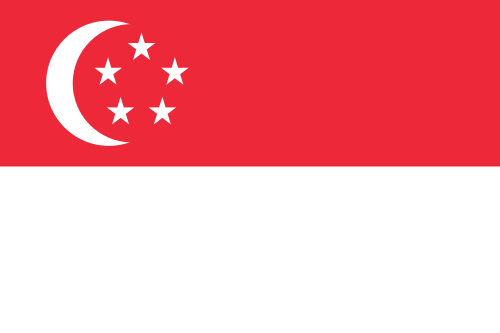 Today this system has moved to incorporate the East, a study of the flag of Singapore (above) might shed some light on this issue with five stars, perhaps denoting the three city states with Singapore or perhaps Hong Kong as an addition to the existing city states. Five of course is a sacred number and which family has the stars and stripes as its symbol? The Aldobrandini. The cannon can therefore be classed as an Idol interceding between you and God. It claims divine authority and is thus enforced by the beneficiaries of that claim, the families behind the Holy See. The Old Testament is a narrative on what happens when you exist by your own laws, outside the laws set forth by God, and, more importantly, the stories present the difficulties encountered to regain the point of balance with truth. In 458 BC-the outcast Palestinian tribe of Judah (disowned by the Israelites) produced a racial creed, the disruptive effect of which on subsequent human affairs, may have exceeded that of explosives or epidemics. This was the day on which the theory of the master-race was set up as “the Law”. The Controversy of Zion Douglas Reed 1951. This doctrine is all about the worship of self, from which is born the Laws of Man creating a new creature, the Hu-Man or, a colour of Man, a creature that wants to become God because the serpent said he/she can. The fall of Adam and Eve is the theology of this lesson. From this doctrine would spawn the idea of the God Human, as promised by the serpent and formed into the master race idea, the chosen amongst Man. The priesthood of the day called this the Oral Law, they claim to have been laid out by Moses, yet only to the high adepts (the rabbis). Jesus would call this theology, “The Laws of Man,” born in the revolt from creation, or, a revolt from natural law. In or around the 4th Century A.D. the Oral Laws were penned to paper in a body of works called the Talmud. 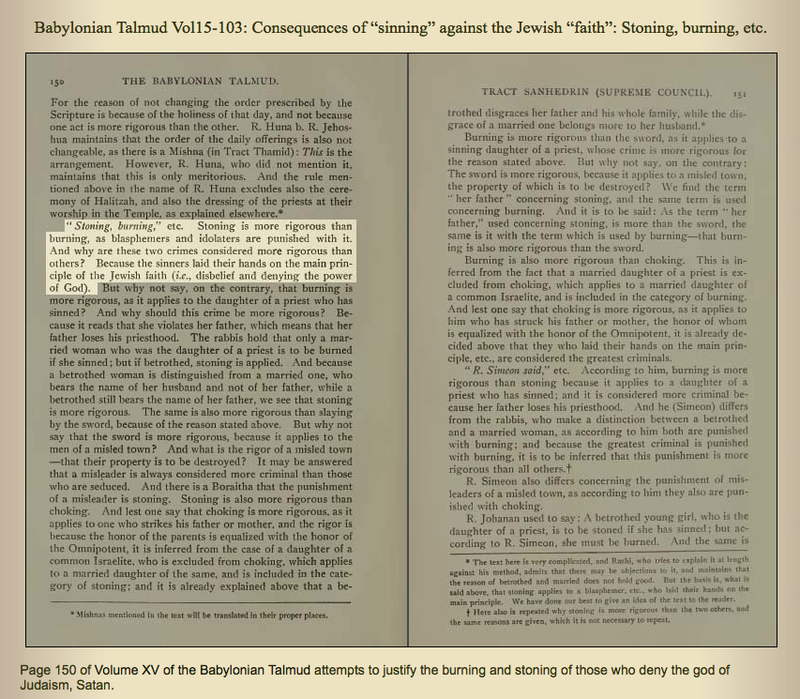 Inclusive of many writings from the Zohar and Cabalistic works of inversion, the Talmud is a huge compendium of writings to mask the core doctrine, which is that of the God-Men and how they must deal with non-Talmudist’s, the Goyim. 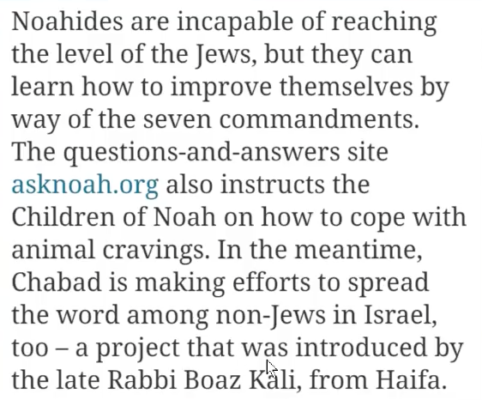 Under the Talmudic agenda, the Rabbis have incorporated the Noahide Laws as the judgement for all non Talmudist’s/Zionists. 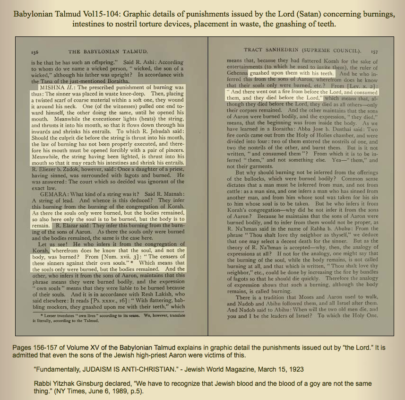 Today, nations are being subverted and force fed debauchery from the global Mafia media, in order they can break the existing society, a big part of which is to destroy the family, and then enforce the Noahide Talmudic Law upon the broken nations as if a judgement from God. This is the system of falsehood known as the Anti-Christ system. This shows itself in the overriding protocol of judgement based entirely on the gold you have in your possession. Basically you are being judged by Mammon and because the world is fixed in Mammon, (the material) the priesthood have no trouble convincing you Mammon is God and from whence the judgement has root. The idea of a formal set of laws given to all humanity (all the sons of Noah) comes from the Talmud and is therefore extra-biblical. 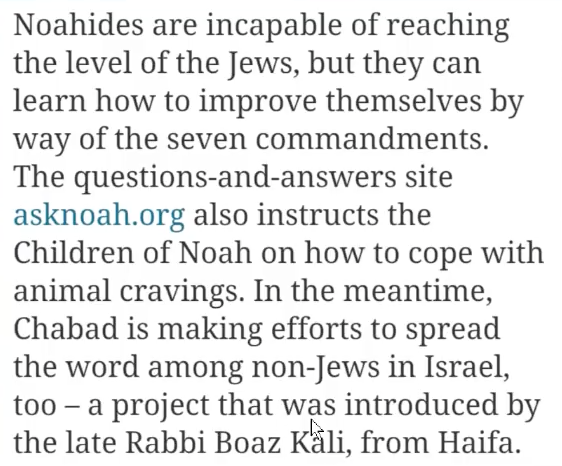 Some scholars believe the Book of Jubilees contains a possible mention of the Noahide Laws. But, again, the Book of Jubilees is not inspired Scripture. 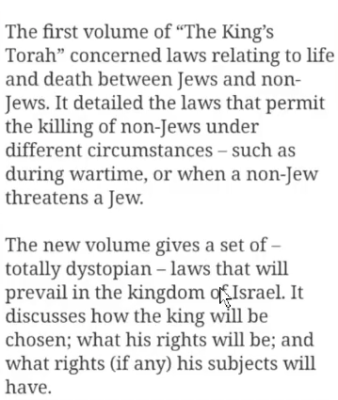 However, the basic seven Noahide Laws are based in Old Testament principles, but it will be the interpretation of those laws in the manner of the Judges, who through legalese, decide what words mean. The Talmud, being a collection of ideas and thoughts penned by Scribes and Rabbis through the centuries, presents the fact, the words are ‘Not’ inspired by the Holy Spirit as is claimed of the early Canon of Christian Scripture. “For the good of Masonry, generally, but for the Jewish nation in particular. This was achieved by Edward VII when he had Lord Kitchener change the highest mandate of Freemasonry from the upkeep of the Church of England and the realm, to the then coming Israel. It is imperative you understand that the Church of England was formed entirely within the canon, the change under Edward VII shifted the Church of England as under the Noahide Laws and Israel. The Talmud can therefore be classed as an Idol interceding between you and God. Enforced worship of a false man made idea. Judge Law is Dog Law. The beneficiaries of this creed are also the enforcers. The Koran is the body of utterances said to come from the Ark Angel Gabriel as a teaching to be followed decreed by Allah. 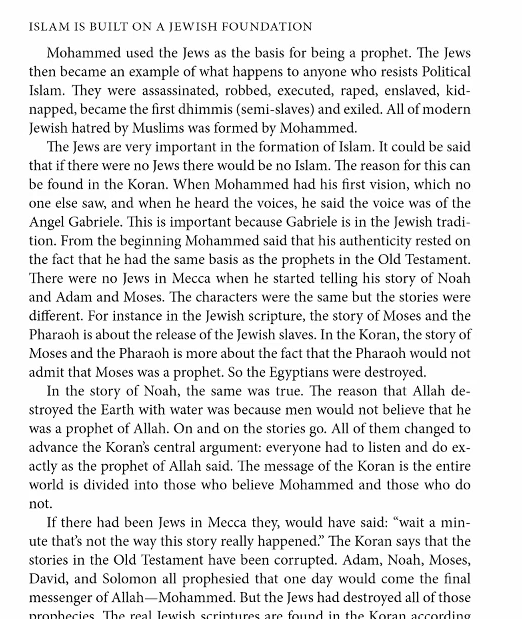 The official biography of Mohamed is called the Sira. The Hadith is a body of works that present the narrative on the life of Mohamed as it mixes with the Koran. From this body of work do the Imams conceal the real terms as laid out in the Koran through outright misinterpretation. This can be seen in the fact, the Koran does not divide the theology into two Houses, that of war and that of peace, this is born from the Hadith and Sira, it is therefore laws made by Man in contradiction to the words of Allah written in the Koran. Another example would be the mistranslation of the Koran’s meaning to Jihad, which is to struggle. From the former misconception, that of dividing the Koran into two houses, comes through another contradiction of the Koran, yet is the basis of the Sharia, which demands Muslims see Jihad as physical war. And another example of laws made by men being presented as laws coming from Allah. The mystical body of Islam is the Sharia, it is the Liturgy of Islam, or, the Sharia is the theology to which the Muslim submits. If the Sharia is incorrect, Islam is incorrect, and thus one is submitting to a falsehood, something that has come between Allah and the Man, in this case the Sharia. 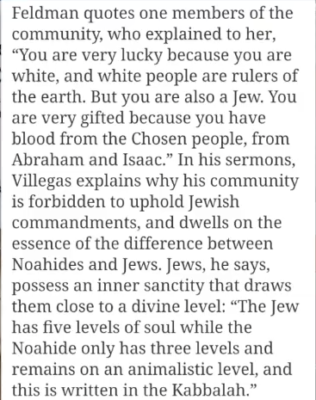 Islam, distinct from the Gospels and Buddhism, but in synchronicity with the Talmud, concern themselves more with non-Muslims. Today’s Islam uses the term, Kafir, to denote non Muslims and yet the original meaning from the Arabic describes a Kafir as Concealer, or one who conceals the truth of Islam. 64% of the Koran is devoted to the Kafir, thus to conceal the truth of Islam is frowned upon as the most high protocol as ordained by the Koran as the word of Allah. In forming the division into two houses, the Imams are concealing the truth of the Koran. The same with the translation of Jihad. The Hadith devotes 37% to the Kafir. The Sira devotes 81% on the kafir. Islam therefore is a 60% doctrine about how to deal with the Kafir. In Islam, idolaters are called mushrikin, and idolatry in strict Sharia-based Islamic societies is punishable with the death penalty. Zollner doesn’t exactly say this, but rather “in case where a Muslim commits apostasy or idolatry, Islamic law foresees the death penalty”. This is presumably referring to apostasy, since according to classical interpretations of Sharia, committing idolatry would be equivalent to leaving Islam. Zollner doesn’t cite any specific sources or explain further, therefore it is impossible to ascertain this. The Sharia can therefore be classed as an Idol interceding between you and God. The beneficiaries of the Sharia also enforce it. The above information opens more questions than it answers, and yet if we shift our intellect above the day to day mechanics, and look at the scripts being played out globally against us all, then we can indeed see how we came to today. Moshe Halbertal; Avishai Margalit; Naomi Goldblum (1992). Idolatry. Harvard University Press. pp. 1–8, 85–86, 146–148. ISBN 978-0-674-44313-6. Poorthuis, Marcel (2007). “6. Idolatry and the Mirror: Iconoclasm as a Prerequisite for Inter-Human Relations”. Iconoclasm and Iconoclash, Chapter 6. Idolatry And The Mirror: Iconoclasm As A Prerequisite For Inter-Human Relations. BRILL Academic. pp. 125–140. doi:10.1163/ej.9789004161955.i-538.53. ISBN 9789004161955. 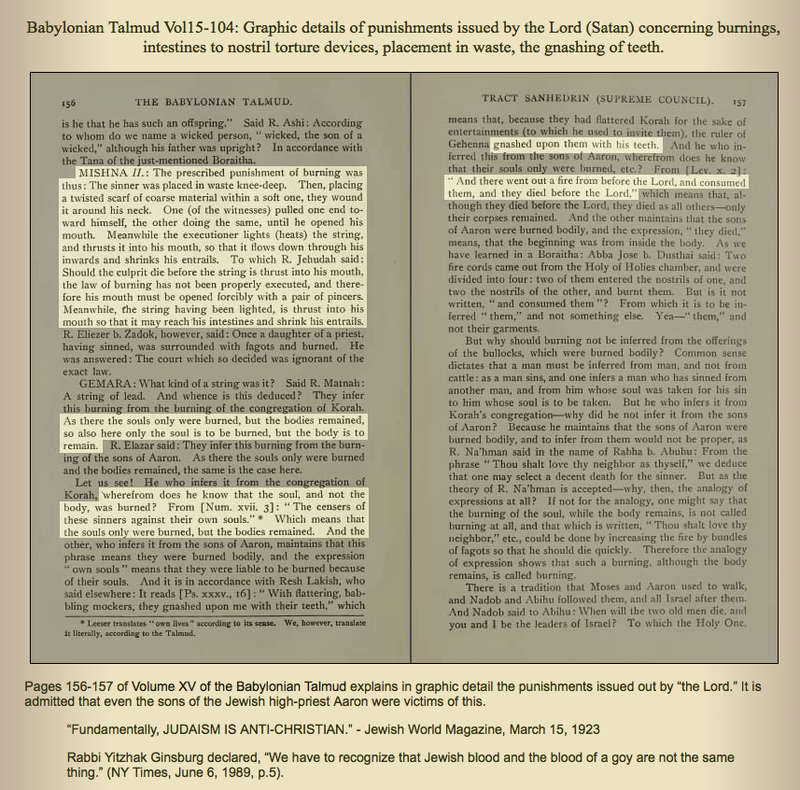 That Freemasonry is Judaism for Gentiles, or Noachidism, can be further confirmed by referring to Judeo-Freemasonry’s own reference books : “Noachidae, Noachites. 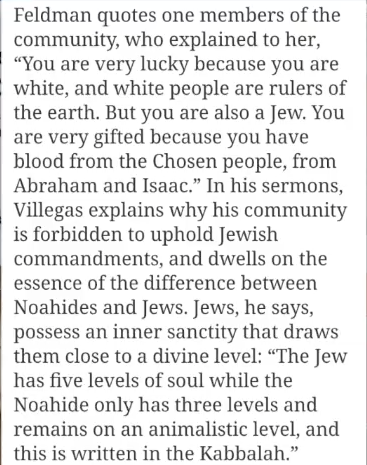 “NOAHCHIDAE : The descendants of Noah, and the transmitters of his religious dogmas, which were the unity of God and the immortality of the soul. The name has from the earliest times been bestowed upon the Freemasons, who teach the same doctrines. Thus in the ‘old charges,’ as quoted by Anderson (Const. edit. 1738, p. 143), it is said, ‘A mason is obliged by his tenure to observe the moral law as a true Noachidae.” (The Symbolism of Freemasonry, Mackey, available at the on-line religious texts archive. 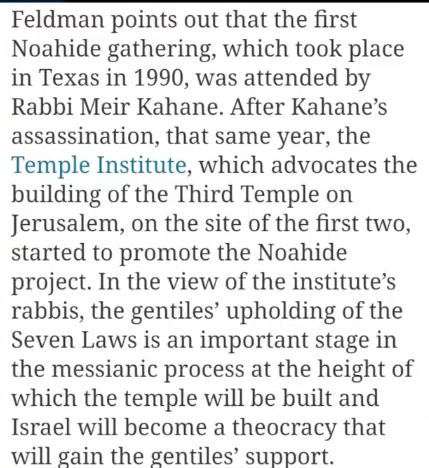 As the quotes above attest, Judeo-Freemasons are — and arguably were from the inception of Freemasonry — Noahchidae, i.e., outsiders at the gate who follow the 7 laws laid down by the Rabbis in the Talmud for gentiles. 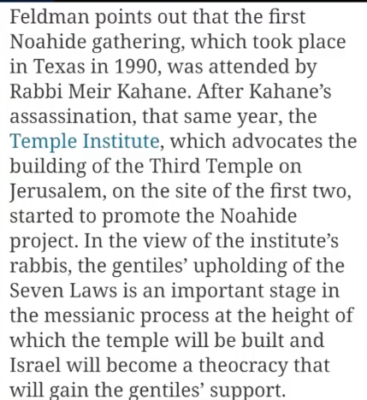 As if these reasons were not sufficient in themselves to establish the fact that Freemasonry is Judaism for Gentiles, we here have Freemasons telling us that they are called Noahchides, i.e., gentiles who submit the Talmudic Noahide laws.